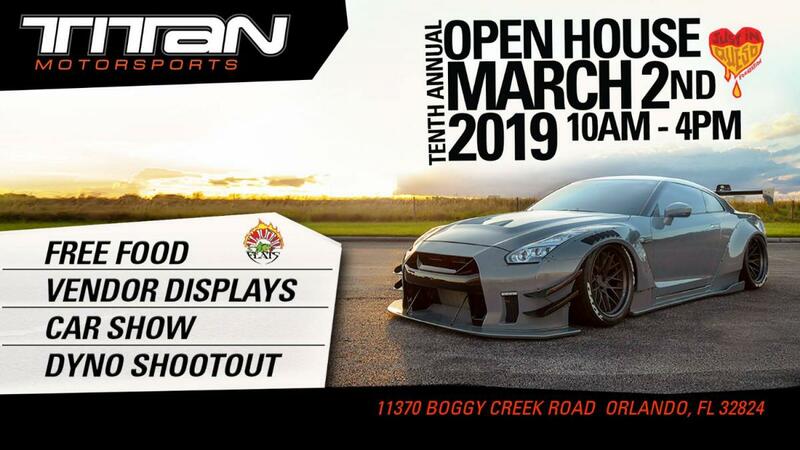 Titan Motorsports will be hosting our Tenth-annual Open House on Saturday March 2nd, 2019 from 10AM-4PM. The open house is a free event open to the public and features a car show. Trophies and prizes for the top vehicles will be awarded in several "best of" classes with a focus on clean modified vehicles. General parking is very limited so we suggest those who are interested in parking on site to pay for the VIP parking option or enter the car show. The dyno format will remain as it has the past few years with pre-selected shops and racers in the area spinning the rollers of our Dynojet 424. We will also be taking a number of interesting local builds and throwing them into the mix, the fee to enter is $50, email Bottle@titanmotorsports.com if you've got something you think attendees would like to see on the dyno. Tijuana Flats will also return offering free food to all attendees, with the proceeds from the event will be donated to their Just-In-Queso charity. We'll be increasing our prize giveaways as well and have reached out to our vendors and partners to donate many great items for the raffles and prizes.